Graph depicting the upward trend of average temperatures from 1881- 2016. 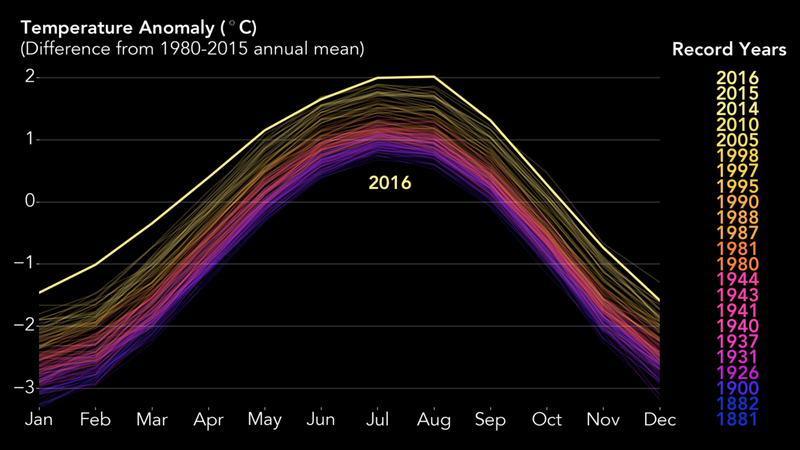 On January 18th, NASA declared that 2016 was the warmest year on record globally. This seems to have become a trend, being the third year in a row to break the record for average temperature. Specifically, the average global temperature was 58.68 degrees Fahrenheit. This marks about a two-degree increase from that of the late 1800s. While this may seem insignificant, NASA has previously expressed fear of what this upward trend in global temperatures means for the future of the planet. Unlike the naysayers that feel that this two-degree increase is insignificant, NASA proposes that global warming will have very drastic effects on the planet. Just a few from their list are precipitation pattern changes, more droughts, rising sea levels, and intensified hurricanes. Specifically for the Northeast of the United States, NASA predicts heat waves and rising sea levels. Certain industries, such as agriculture and fisheries, are also expected to be compromised. Dave Shimel, a supervisor of JPL’s Carbon Cycle and Ecosystems group, stated, “Most of temperature change may occur during a small fraction of the year, when it actually represents conditions that could be five or ten degrees warmer than pre-industrial temperatures.” This means that the Earth is not experiencing constant two-degrees above average temperatures. Instead, it is experiencing five or ten degrees above average temperatures for a few months at a time in a specific location. It is much easier to believe an increase of ten degrees for a few months of the year could wipe out the coral reefs than an increase of two degrees. This is what explains the drastic effects NASA predicts for the planet in the next century.